I wasn’t expecting much when it came to Death Valley National Park. Given its name I assumed it was basically a bit of a waste land with not much going for it. So it came as a bit of a surprise when we visited and discovered it was absolutely stunning. 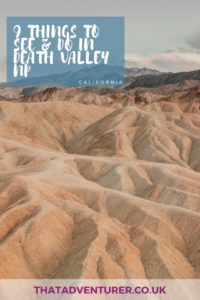 Death Valley is a bit different from a lot of the other National Parks we visited. Unlike the others which have an official entrance and a big visitor centre we didn’t see this at Death Valley. 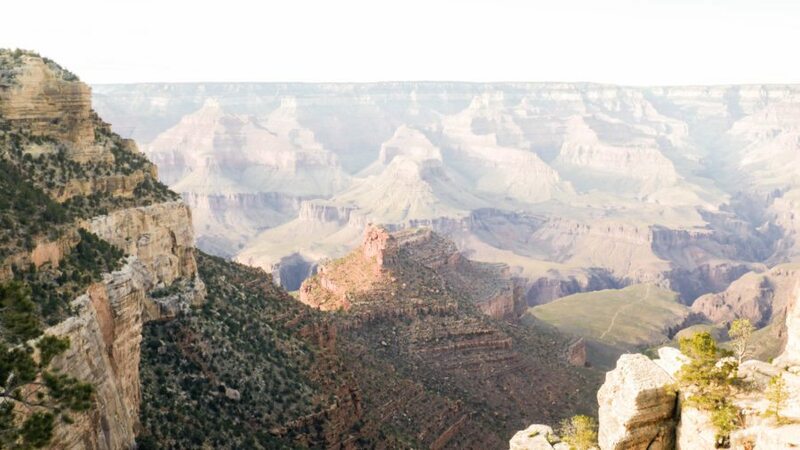 You basically just drive in, fix your National Parks pass or stop and buy your entrance fee, and get exploring! One of the best things about Death Valley, for us at least, was that there was a free campground in the middle of the park. This came in handy since there was a huge lightning storm the evening we were there – we didn’t fancy driving much closer towards it since Elvis was the tallest thing around for miles! 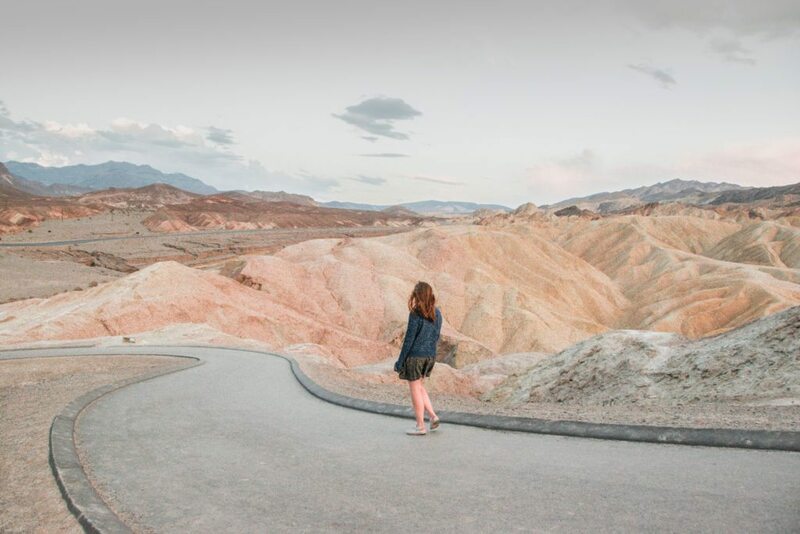 Here are some of the best things to see and do in Death Valley National Park during your visit. Right in the middle of Death Valley, there’s a desert complete with sand dunes! You’re free to walk in amongst and over the sand dunes but, again, don’t forget your water as you’ll most definitely need it. Since we entered Death Valley National Park from the east, one of the first things we came to was Dante’s View. 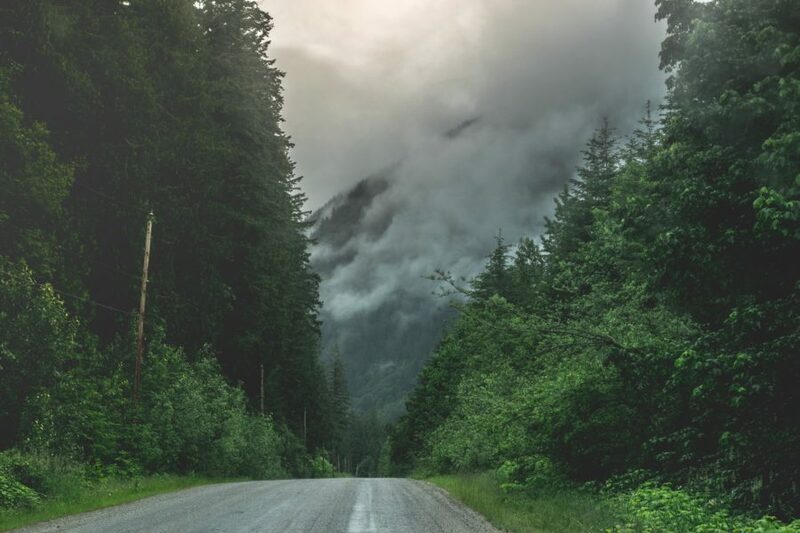 The drive up there is quite far from the main road which cuts through the National Park but the view is so worth it! If you have a trailer you’ll have to leave it in one of the car parks as the drive is very, very steep up to the top. 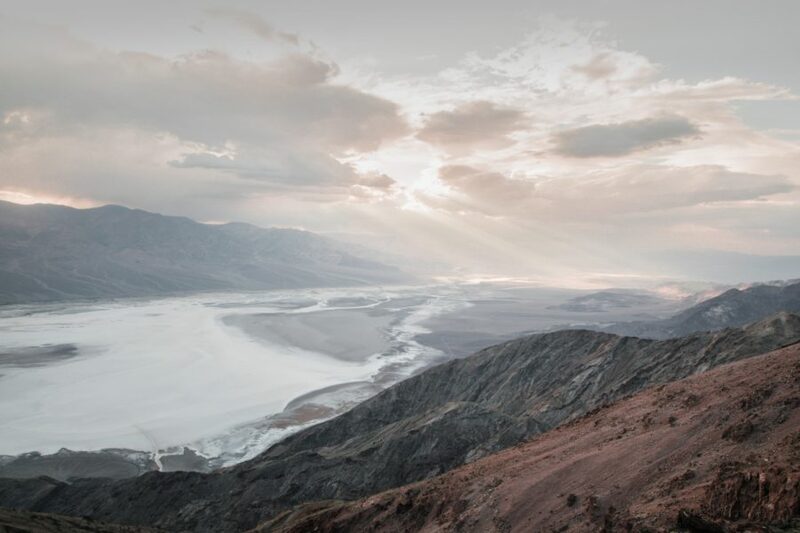 From here you get a fantastic view of Death Valley National Park and Badwater Basin. We arrived just as the sun was starting to peak through the clouds and the rays came through – highly recommended. The drive to Artists Pallete is very scenic and you won’t believe the colours in the rocks. It’s just like an artist has come along and started to mix his colours up right there on the rocks! The 9 mile road is one-way and is only drivable with vehicles less than 25 feet in total length. 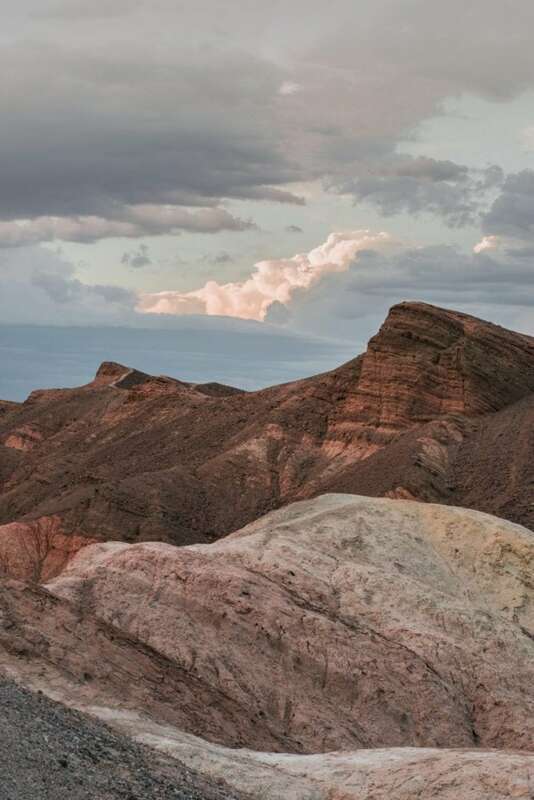 Winding through otherworldly badlands, the Twenty Mule Team Canyon is a 2.7 mile, one-way loop drive. It’s unpaved but generally drivable without a four wheel drive assuming it hasn’t rained recently. 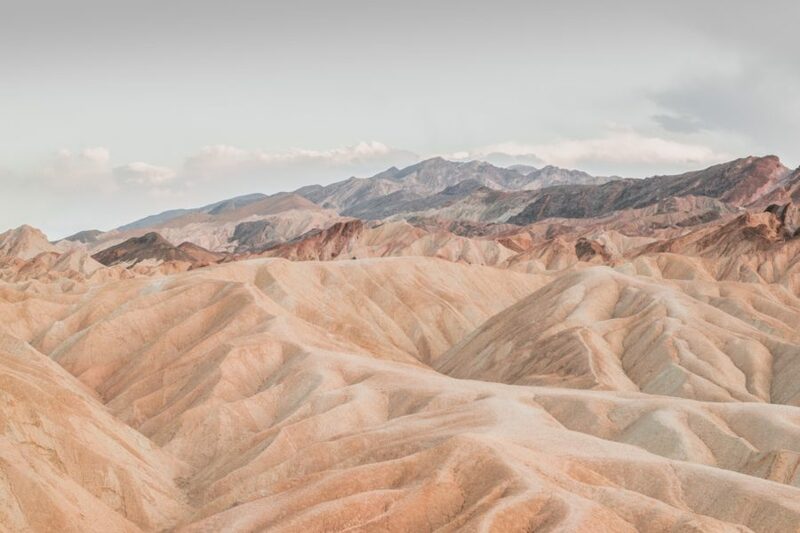 The colours of the rocks at Zabriskie Point are amazing, I really didn’t expect it! It’s particularly good at sunset that’s for sure! Badwater Basin is the lowest elevation in the US. It’s actually 282ft below sea level and it gets extremely hot down there. 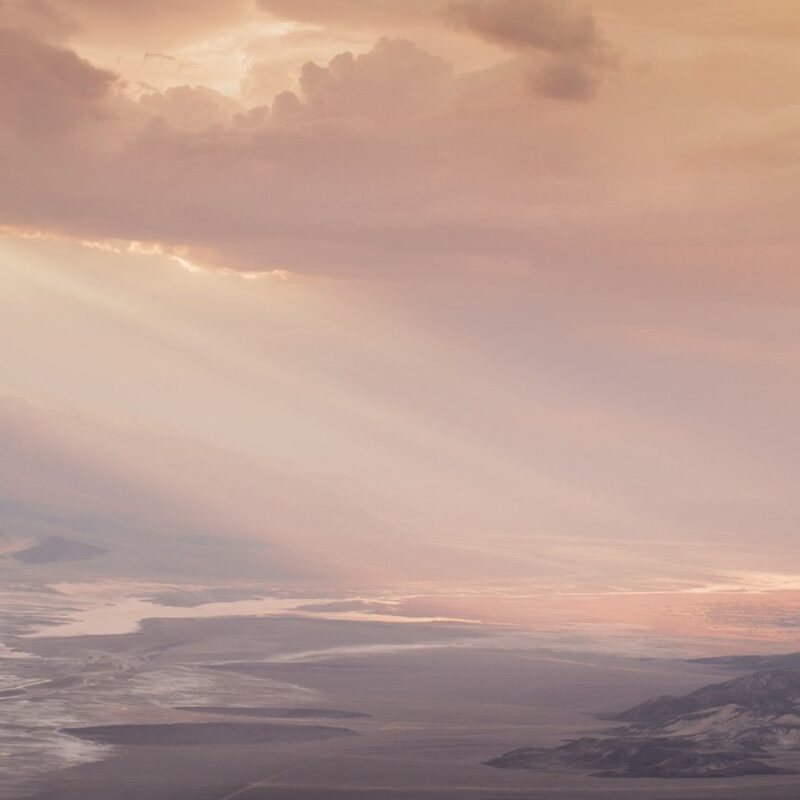 You should probably try and avoid Badwater Basin at midday, but definitely take a drive over, or get out and have a quick walk in the morning or evening. It’s a pretty cool place to see. This is such a weird rock formation. 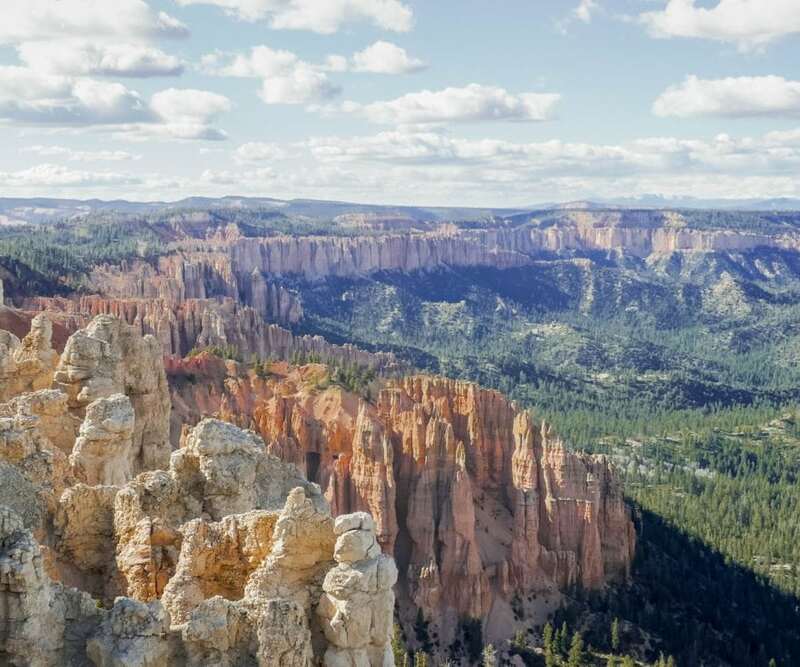 It’s a huge area of rock salt eroded by wind and rain into jagged spires. Apparently, if you listen carefully you’ll hear sounds like tiny pops and pings. It’s the sound of billions of tiny salt crystals bursting apart as they expand and contract in the heat. If you’re a fan of arches then don’t miss this natural bridge in Death Valley National Park. It’s just a short walk from somewhere you can park your car and it’s a pretty cool spot. 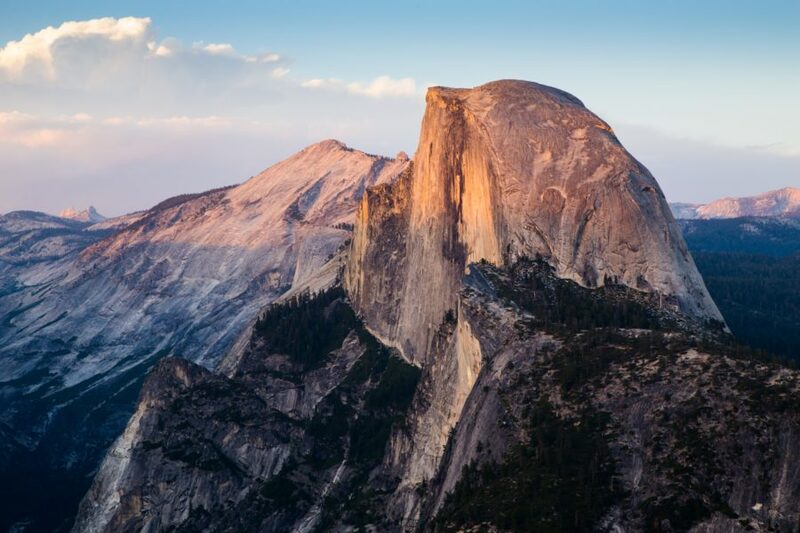 There are a few spaces here where you can camp for free; even in a car or a tent. We pulled up in the evening and the places were all taken but we managed to squeeze in next to a car camper and settled in for the night. 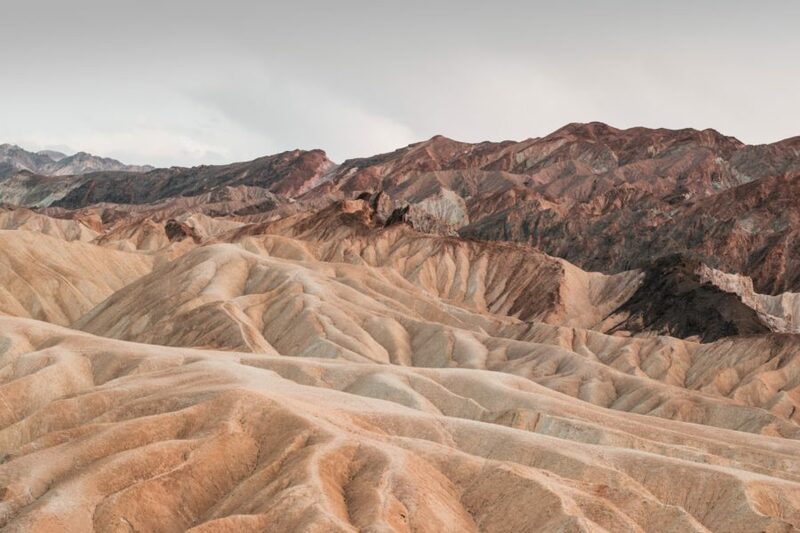 We didn’t fancy trying to drive any further what with all the lightning and rain – it was the biggest storm we had during our entire trip – I hadn’t expected it to happen in Death Valley National Park! Thanks Lisa, it was a beautiful National Park! Have a great weekend. Looks amazing! 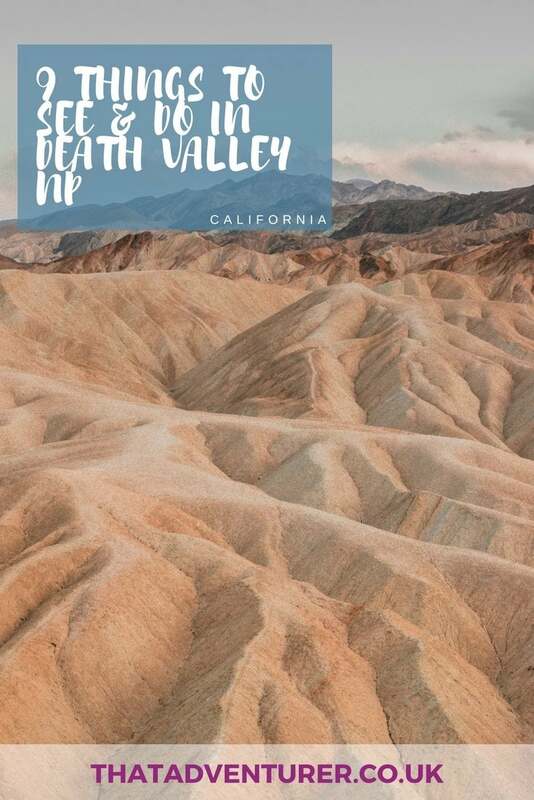 Death Valley is on my long list of American national parks I want to visit. What a great surprise that there’s so much to see and do there (I also thought it was basically just a desert). Great post! It was so beautiful! Highly recommend it. 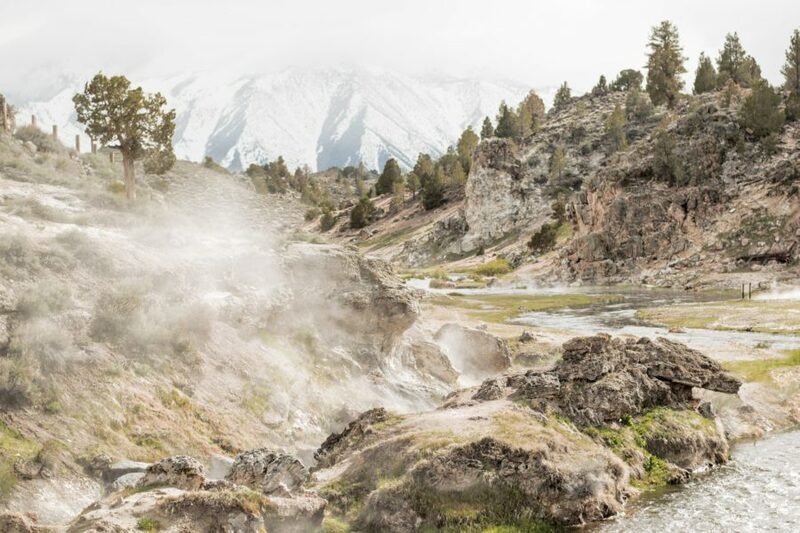 Which other parks are on your list?